Perched on a hillside, the Mount Nevis Hotel has one of the most stunning locales in the Caribbean. You won’t tire of the sweeping view of the ocean and neighboring St. Kitts. On a pricey island, it’s undervalued. THE ROOMS: 32 spacious units with kitchenettes. The rooms are simply and comfortably furnished, though not high on charm. WHO SHOULD GO: Couples looking for space and quiet; families looking for space; people who don’t need a resort to tell them what they should be doing every ten minutes. WHAT’S THE DEAL: "Match Made in Nevis" runs through December 15, 2006. It’s a 50 percent off deal. Travelers who book a two-bedroom superior suite with kitchen for four nights at $500 per room, per night get four additional nights free. So that’s $2,000 for eight nights for a suite that can accommodate a family of four or two couples. An eight-night stay works out to $62.50 per person, per night. EVENING DIVERSION The chirping of tree frogs, because after dinner, that’s it. CAVEAT You’re not on the beach, but a free shuttle takes you down to the sandy beach at Nisbet Plantation, about five minutes away. INSIDER TIP You can still play golf at the Robert Trent Jones II course at Four Seasons Resort Nevis, about 20 minutes away. 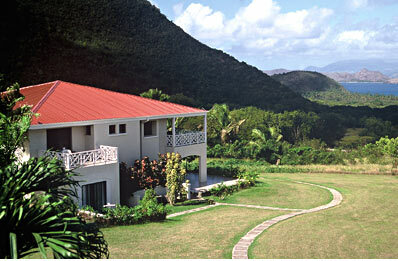 But you’ll save a fortune on accommodations by staying at Mount Nevis.